Looks good. Interior is superb. Packed with tech. Expensive. Not quite as practical as Q7. Eight-speed tiptronic gearbox is frustrating. It's taken Audi a little while to fill a gap in its range with a more expensive, less practical version of the Q7. But it's happened. 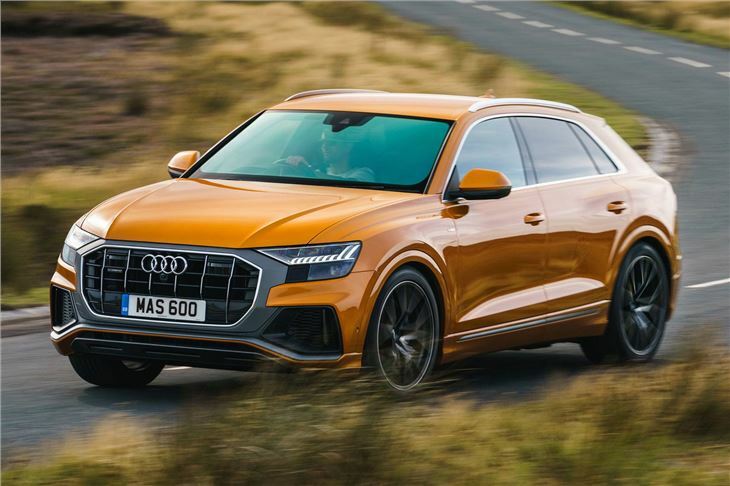 Badged the Q8, Audi's new flagship SUV will take on the BMW X6 and Mercedes-Benz GLE Coupe, as well as the Range Rover Sport and Maserati Levante. Prices for the top-spec Vorsprung version start at £85,040. 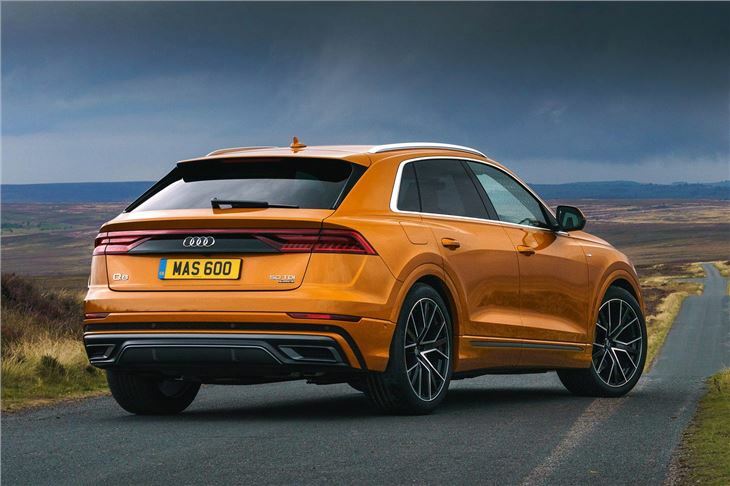 At nearly 5.0-metres long, the Q8 is slightly shorter than the Q7 on which it's based yet 27mm wider. 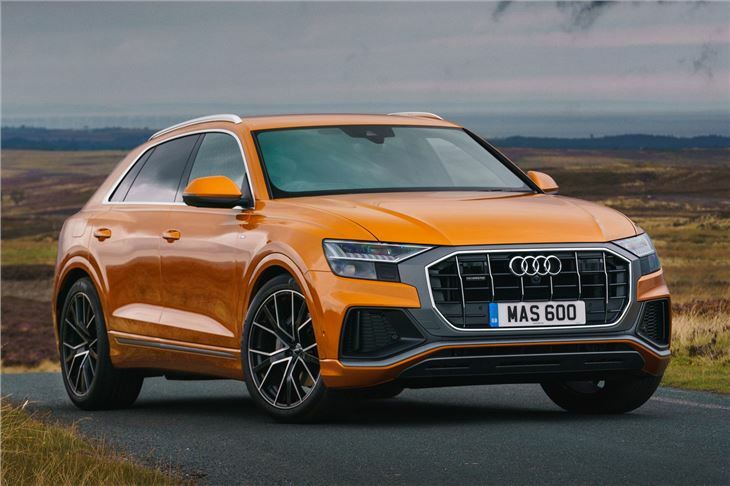 In terms of styling, we think Audi's done a good job of making this look a lot different to simply a Q7 with a sloping roofline. 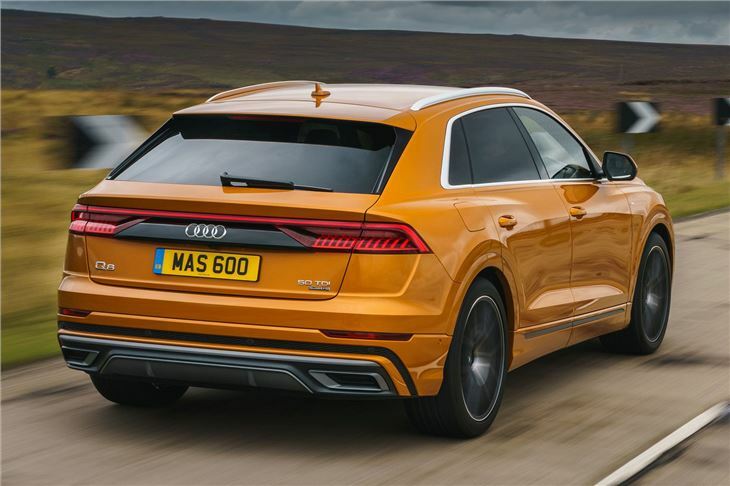 Its coupe-style roofline means it's not quite as practical as the Q7, holding 605 litres of luggage with the rear seats left up (compared to the Q7's 770 litres). While the Q7 is available with seven seats, the Q8 will only come with five. 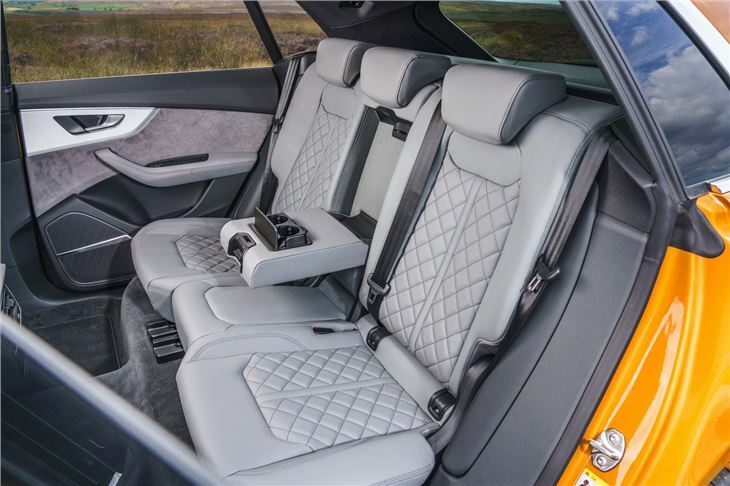 Space aside, the Q8's interior is typical Audi plushness. The brand's Virtual Cockpit replaces conventional dials, while there are practically no buttons. Two large central touchscreens provide access to the infotainment, navigation and heating. It's a similar layout to other recent Audi models including the A6, A7 and A8. Only one engine will be available at launch - a 3.0-litre turbodiesel producing 286PS and 600Nm of torque. Badged the 50 TDI, the V6 uses Audi's eight-speed tiptronic gearbox, reaches 62mph in 6.3 seconds and a top speed of 144mph. Mild hybrid technology means it can coast at speeds of between 34 and 99mph, automatically turning the engine off, while stop-start kicks in at speeds below 13mph. A smaller 3.0-litre diesel with 231PS (badged the 45 TDI) and a 3.0-litre TFSI petrol with 340PS (55 TFSI) will follow early in 2019. 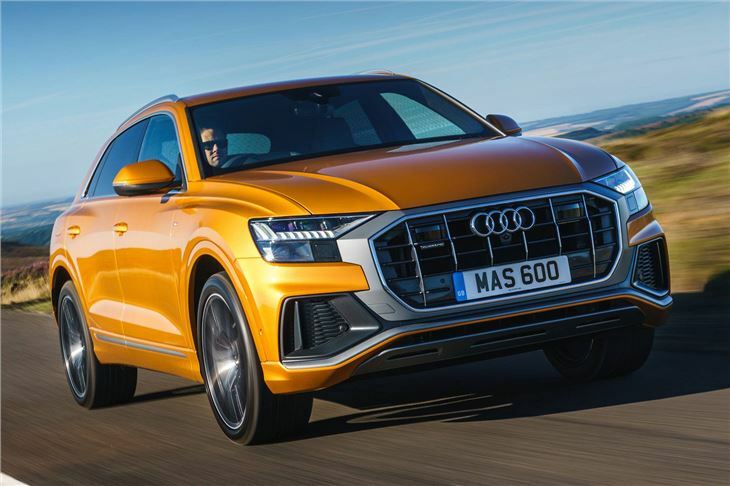 The Q8 is exclusively four-wheel-drive, with a mechanical centre differential splitting torque between the front and rear axle at a ratio of 40:60 as standard. When required, it can be shifted to the axle with the most traction. 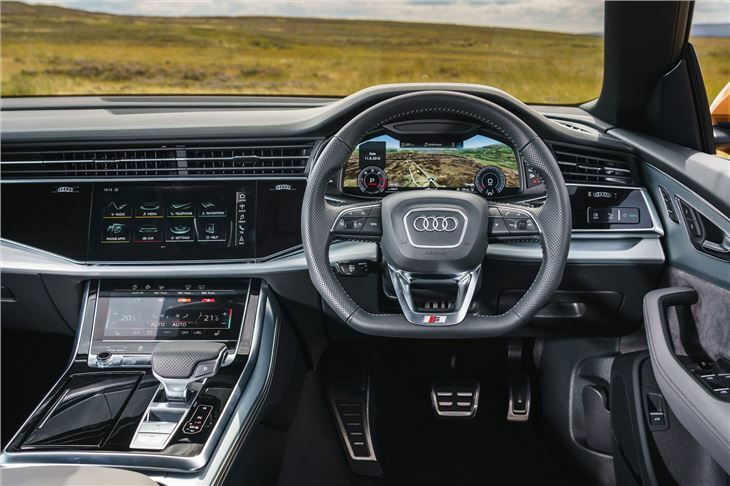 Despite air suspension fitted as standard, the Q8 has a jarring ride - especially on the 22-inch alloys fitted to the top-spec Vorsprung model. It's not particularly sporty, either, but it's pretty quick in 50 TDI guise. The Q8's at its best covering long distances on smooth motorways, although technology such as four-wheel steering helps around town. Ride aside, the Q8 offers typical plushness. It's expensive, but it makes a statement - and you'll love or hate the way it looks.